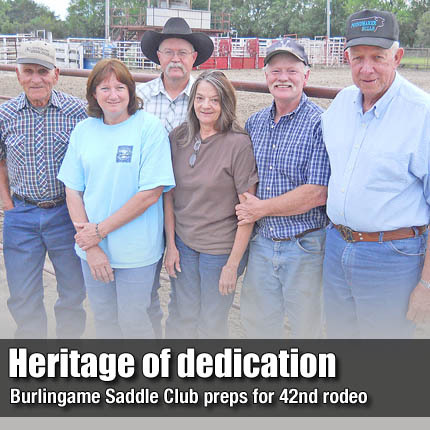 Heritage ran as deep as enthusiasm when these Burlingame Saddle Club members made plans for the 42nd annual Santa Fe Trail Rodeo, to be held this Friday and Saturday at Burlingame. From left, Paul Lang, Sharon Miles, Kenny Miles, Pat Rusher, David Prescott and John Pickett. Lots of saddles clubs and rodeos have come and gone, but for more than four decades, the Burlingame Saddle Club has been going strong, hosting a rodeo every year. Activities continue with members’ enthusiasm, just like the club’s beginning. “It’ll be the 42nd annual Santa Fe Trail Rodeo this weekend, Friday and Saturday evenings, at our original grounds on the west edge of Burlingame,” said Paul Lang, a club charter member. “There have been plenty of changes, but our objective has remained the same to have horse activities for kids and families,” John Pickett said, as he remembered signing the charter. David Prescott, this year’s club vice-president, noted several generations of original families are still active in the club. Prescott’s children are a third generation to have participated in the club. Kenny Miles is a second generation club member, and his grandchildren are fourth generation. Following in bootsteps of his father, Lewis Miles, Kenny and his wife, Sharon, have served in several club offices and many committees. “We’ve had so many activities, it is hard to list them,” Kenny Miles said. “But, we’ve really had countless good times and made lifetime memories and friends,” Sharon Miles said.